Brooklyn – I’m there/here. I’m in New York for Book Expo America (all the madness starts tomorrow with BEA Bloggers), and staying with my cousins in a lovely part of Clinton Hill. We’ve been going to fun places to eat at night and randomly dropping in to open art studios and truck festivals because they’re happening just down the street. Last night outside one of the studios an artist was doing a huge mural on a fence – a graffiti mural. And I couldn’t help myself – I thought ‘how perfect! I’m reading about Australian teenagers with art obsessions, and I happen across graffiti happening in real life half a world away.’ The world is funny sometimes and the coincidence burns bright in my mind. 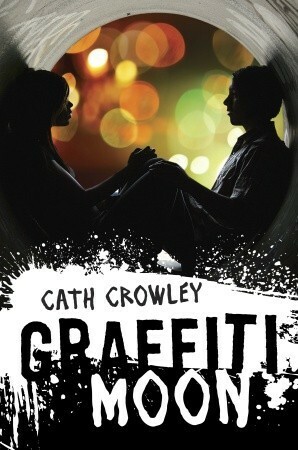 That book I read (finished it just now, actually) was Graffiti Moon by Cath Crowley. It’s a story of one night – one evening’s epic quest and the beauty of letting an adventure move your world. Graffiti Moon is narrated in two voices by Ed and Lucy (with various contributions by Poet), two kids with wildly different paths and pasts that are about to collide, connect and possibly shatter. But more than being about the lives of two teens, this book is about art and finding out the truth, about second chances and unconventional choices. It’s about forgiving yourself and finding a way (and maybe, love. the real kind.). Ed is in stasis when we meet him – he’s dropped out of school, lost his dead-end job, and broken up with his girl friend. He’s about to take a bad turn – because the world feels like it’s gray and he’s trapped. Lucy is on the edge of a new life, but she can’t help worrying about her parents, her friends, and obsessively searching for the graffiti artist she admires, Shadow. When she’s saddled with former crush Ed for a night, she is not pleased. The unexpected adventure that results is a little bit heart-breaking, compulsively readable, and written so that you feel beauty and truth and adrenaline running free in your veins. She moves close and holds my hand, and I go from scared to mad. Because I’ve been wanting her to do that all night, and it’d be perfect if we weren’t surrounded by a psychopath and his gang of psychets. Recommended for: fans of Markus Zusak’s I Am the Messenger, the romantic, the realist, the artist, the simple art enthusiast, and anyone who appreciates painfully beautiful words that may steal away a reader’s heart. I am always so happy to read a review of Graffiti Moon and I am so glad you enjoyed it! Enjoy BEA! I love when a book coincides with real life. I hope you have fun for the entirety of your stay in NY!